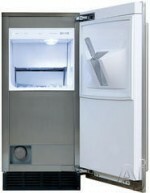 One little appreciated product from the Sub-Zero line-up is the 15-inch undercounter Subzero ice machine. While everyone is familiar with the high-end Sub Zero fridge freezers, many people do not know about their other attractive and functional chilling appliances. The Sub Zero UC-15I comes in four different configurations. It is designed for installation beneath a counter top to be discreetly out of the way, but readily accessible. Purchasable with a stainless steel panel, you can also have a custom cabinet panel installed to match the trim and look of your existing cabinet woodwork. With a production capacity of 50 pounds of ice per day, these small ice machines are suitable for most residential requirements. Combine with a storage capacity of 25 pounds; you can have sufficient ice on hand to keep drinks cooled for a large group of family and friends. The ice produced by these icemachines is clean – due to the built-in water filtration system – and has an appealing octagonal shape. Available with a gravity drain (the UC-15I and UC-15I)) or a drain pump (the UC-15IP and UC-15IPO) these 15″ inch widths units are available in both indoor and outdoor ice-maker configurations. The outdoor UC-15IO and UC-15IPO models have a stainless steel door with the option of the pro handle, designed to match the look of a Wolf outdoor grill. Other appealing features of the Sub Zero ice machines are the ice scoop that is stored within the door, and its high power ice making solution can function successfully in temperatures of up to 100 degrees Fahrenheit. The ‘change filter’ light and bin light make for ease of maintenance and ease of use. While not as heave-duty as commercial type Hoshizaki and Manitowoc ice machines one of these Sub-Zero icemakers, once plumbed to a reliable water supply, can produce amounts of high quality filtered ice sufficient to meet all your residential ice-manufacturing needs.